Don’t Get Burned This Winter! 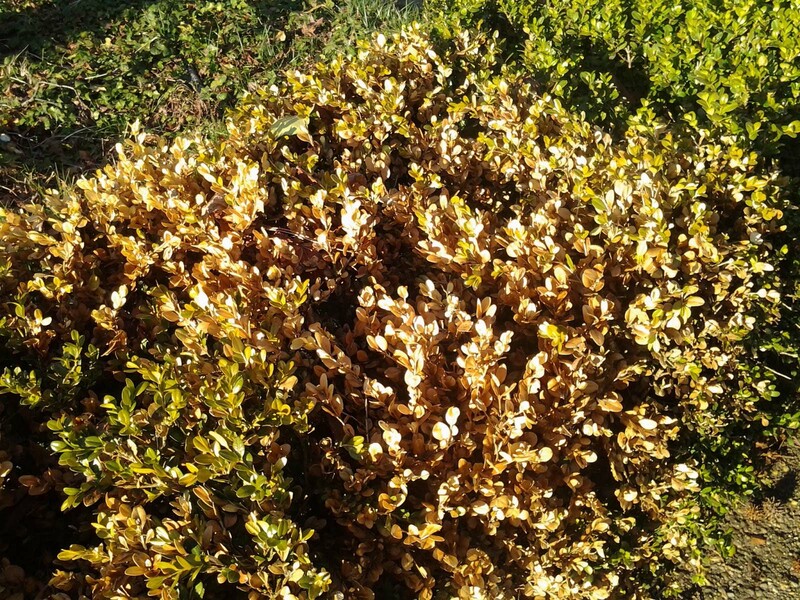 Desiccation, or Winter Burn, is a problem that primarily affects both broad-leaved and needled evergreens. Low soil moisture, wind, and freezing temperatures are the three main factors that cause Desiccation to occur. It all begins with how plants create their energy, or ‘food’. When plants gather up solar energy during photosynthesis, they release water as part of the process- and this release of water is called transpiration. Sometimes, in very cold and windy conditions, evergreens lose their moisture faster than it can be replenished due to the frozen ground. This causes the brown or rusty looking discoloration Winter Burn is known for. However, the ‘burn’ in Winter Burn is not an actual burn at all, but rather a drying up of the foliage caused by the plants rapid moisture loss! At this point you may be saying to yourself, “Well that’s great, but what can I do to try and prevent this? What if my plants are affected?” Preventing Winter Burn is always a better option for your plants as opposed to trying to pick up the pieces after they have already been damaged. While it isn’t possible to guarantee your plants won’t be affected, there are simple steps you can take to improve your odds. Make sure your plants are being adequately watered (but don’t over-water!) before the ground becomes frozen and your plant’s roots are unable to absorb as much water and nutrients from the soil. This is going to be especially important for new plantings that are still becoming established. Protecting your plants from the wind will also help prevent excess transpiration. Planting in areas that are protected from the wind is ideal, but if you already have established plants without wind protection you can insulate them with a burlap wrap. If you already have evergreens that have Winter Burn damage they may need a little help getting back to a healthy state. Prescription Fertilization, proper watering techniques, and pruning of the dead stems after new growth has begun are the best ways to treat Winter Burn. Providing a small amount of mulch around the base of the tree (see figure 1 for proper mulch depth) will also help conserve moisture and eliminate weeds that will compete for nutrients. If your plant dies due to severe Winter Burn, it is best to remove it before insects and disease take over and become a threat to other nearby plantings. Been burned by Desiccation in the past? Contact us to set up an appointment with one of our Consulting Arborists and we can try to prevent it from happening again!